I’d left Wilhelm in dire straights, beaten to the ground by Khazar and on the brink of death but, as the gods are looking out for him, an arrow comes out of nowhere and plunges into Khazar’s leg. Yeay! So how would I write this battle? I wanted them to work together to almost defeat Khazar but I wanted it to be special too. 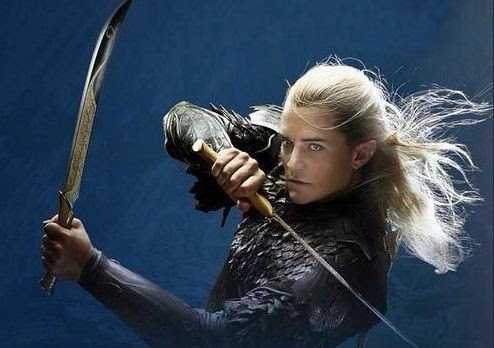 I remembered Orlando Blooms scenes as Legolas in the Middle Earth books and I pictured the way in which they’d almost make him dance his battles. This was the feel I wanted. And so, with Wilhelm striking out with his solid sabre and Valen twirling and spinning, they take on the power hungry warrior who will stop at nothing. Its all going well until, Khazar’s spell is complete and he starts to turn. This was one of my best twists in the overall plot that came to me later on. Khazar had killed Valen, fine, but what if there was something special about her? What if she is some sort of True Blood Elf, genes passed down from the first Elves that came to the planet, and to make Khazar’s immortality spell complete he needs her blood over everything else. In the sequel you find out how this goes and how he accomplishes it but when Valen dies at the end of this scene what if he thinks he managed it but it was actually an act of suicide when she knew she was going to die? Think of a cyanide pill but in some sort of herb form. This would give him a weakness; he believes he is immortal when he actually is not. So Valen ended up with crushed neck and Wilhelm scrabbles away into the undergrowth, arm broken. After seeing her Elven sword is magically (more about that later) he grabs it from the grass whilst making his escape.